Having trained for many years as a professional photographer specialising in Architecture & interior design Iain has the kit and the skill base to fulfill your expectations when it comes to capturing the very best elements of your buildings. Growing up in Yorkshire instilled a love of the common local architectural features such as mullioned windows and yorkshire flag stone roofs. This passion for traditional as well as increasingly modern architecture fuelled a desire to record buildings through the use of cameras. Drawing castles as a child probably set the original seeds for this passion. Architectural photography is not restricted to the facia of a building, the interiors are just as interesting and important in terms of design and function. It can be difficult to correctly light and white balance an interior setting, especially ones that are reliant on various artificial lights and this is why Iain uses the most versatile forms of professional lighting to capture appealing interior scenes at their best. The ARRI msr lightsIain employs create light with all the characteristics of natural daylight. Wherever you are in the Yorkshire region and whether your project is contemporary or traditional give Iain a call today for a great photography quote. Listed and historical houses, mansions and ruins will all be creatively shot using correct architectural cameras and kit to provide high resolution images for large scale print or online portfolios. Modern and commercial buildings can be just as creatively recorded and then the images used for advertising or sales media. This service will be of great interest to the elite estate agents of south Yorkshire, North Yorkshire, East Yorkshire and West Yorkshire. Minor blemishes or unwanted bins etc can be skilfully edited out of the shot using advanced re-touching techniques. Heritage properties can be shot in a way that enhances their age through compiling a combination of shots with different exposures then manipulated through retouching. With ultra modern new-build architecture whether it be commercial or domestic the key is to choose the correct wether and time of day. This is usually when the sun is not too strong and so the resulting shadows and tones are soft enough to accentuate the reflective surfaces and sharp lines. Alternatively it may be at dusk with a little warmth in the sky or dawn when the light tends to be at the cooler blue end of the spectrum. Happy customers of Iain‘s Architectural services include ‘The Green Building Store’ who made the windows and doors for Kevin McCloud’s home. Just call Iain on 07712284995 to discuss your photography requirements. It’s fantastic to shoot a structure as a silhouette during sunset with the recognisable leeds skyline out of focus in the background. Dazzling displays of urban lights from windows and street lights. Narrow streets in the centres of cities don’t always create problems with getting the whole building in shot… a trusty german Linhof camera with a wide angle lens will usually get around such a problem. Iain can skilfully stitch shots together with this high-end ‘architecture specific’ kit to create dramatic panoramas or tall & narrow crops. The old dis-used industrial buildings juxtaposed with ultra-modern skyscrapers such as the collection of buildings down water lane (LS1) can provide perfect settings for stunning Architectural photography. The incessant Leeds drizzle can only serve to enhance these moody images. Iain has many clients who have been happy with his services for many years, these include the ethical window and door manufacturer ‘The Green Building Store’ who supplied pieces for Kevin McCloud’s home. Other editorial work that Iain has covered includes commissions for ‘Beautiful kitchens’ magazine (part of the IPC media group). Many advertising placements within ‘Elle decoration’ have featured Iain‘s work. These projects for adverts and editorials have taken him far and wide over the ten years of self employment across the country from Elgin in Scotland to Poole in Dorset. If you require an Architectural photographer in the Leeds area but feel that your particular project is brought down by it’s location or seems to be tricky to capture in the best light then call Iain Richardson who will manage to find the correct angles and lighting situation to bring your ‘build’ to life. Architecture firms such as Smith & Taylor LLP are regular repeat customers of Iain Richardson so join the growing list of practices with eye catching shots. Call Iain on 07712284995. By revisiting & shooting the same building in various weather conditions, Iain can produce a neat portfolio of shots , maybe select the best three and you’ll have yourself an great triptych. Urban environments are littered with a multitude of reflective surfaces which can look great within architecture shots, it’s good to include, for example: windows, water features, puddles and wet streets in with your building project portfolio. Iain will capture all these fantastic gritty Sheffield scenes for you. A trick in post production called HDR (high dynamic range) can greatly intensify the contrast held in these wet urban scenes. 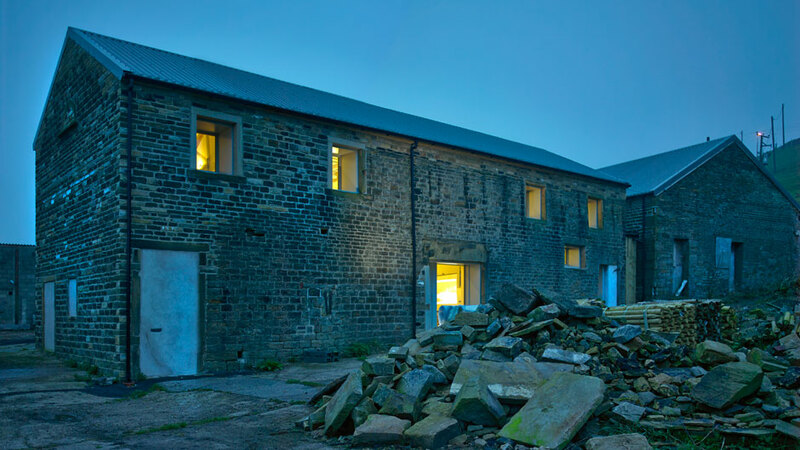 Whether it’s trendy new student accommodation, a Bradfield barn or a newly redeveloped bar down Eccleshall road Iain has all the professional kit and skill to bring your project to life. He has worked with all kinds of Architects in the past from purely commercial to solely domestic practices, regular clients such as London architecture firm Smith & Taylor LLP are always happy with the results. By using the best professional kit including a Linhof M679 and a Phase one DF camera fitted with a shift lens Iain can document any project with true flair and accuracy. He can be in the Sheffield area in moments to record your building during a particularly amazing sunset or after a rain storm in order to capture the best possible shots. Publications that have featured Iain‘s work include Living etc and Architects Journal (AJ). His own house was shortlisted for a RIBA prize in 2012 and so It is safe to say that Iain eats, sleeps, breathes Architecture. To make sure your Images catch the best of each projects potential then call Iain Richardson for a quick chat about your photography needs on 07712284995. You can reach Iain on 07712284995.